"A girl who is an artist met a boy who is a hunter. They fell in love, got married and had a son. They named him Mr. P...They decided to start a little business of cool onsies and tees for Mr P and his buddies to wear. 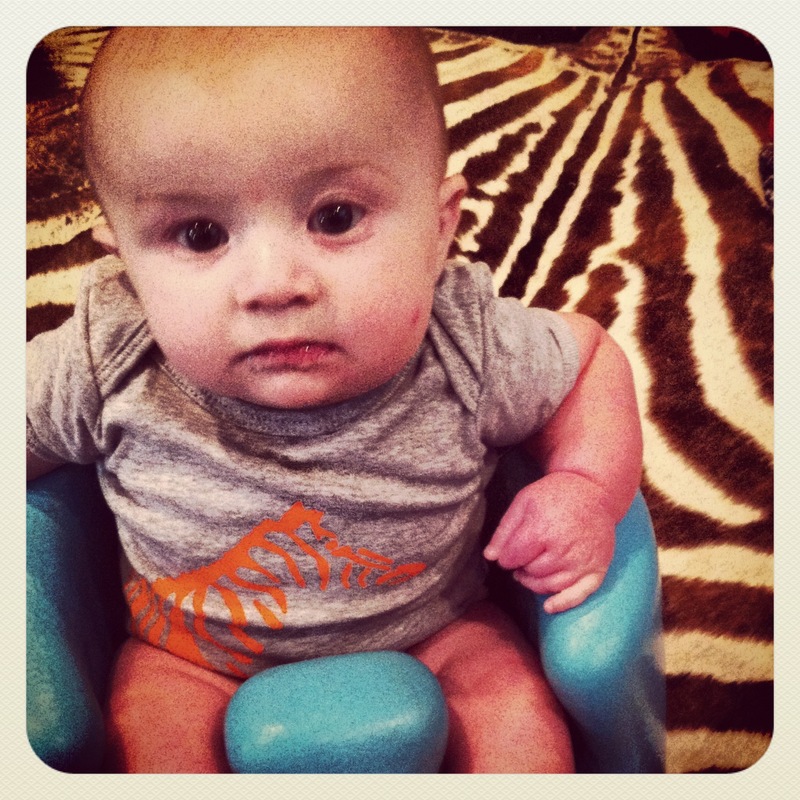 Mr P's Tees is Brent and Lissy Compton"
Well, that is the short of it....after we had Mr P, we noticed that there were not alot of cool onsies for babies, or at least ones that we thought were cool. My husband and I are not into all the ruffles, gingham, sail boats, etc...he likes camo and dead animals, and I like drawings and live animals. HAHA! So, after some thinking and plotting, I went to Hobby Lobby and bought some onsies, some fabric paint, some heavy paper and an exacto knife. 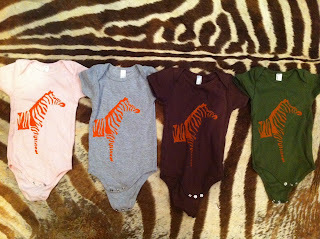 I proceeded to hand paint a zebra design with a cut our stencil I drew on the onsie and posted it on Facebook. It got a good response. So, the hubs and I talked and decided to become business partners (as well as partners in life!) and created Mr P's Tees!!! I come up with the designs and Brent does all the rest. We are in the process now of forming our LLC and just got our first batch of onsies printed- Thanks to the help of Brent's cousin, Lori Nolan Rockett at Reflections in West Monroe. It was neat going over there to her store and picking out the color orange for the ink that I had envisioned in my head. and we are now working on 2 more designs. We will also be selling them at the August 2nd art crawl in downtown Monroe at The Becton Gallery. We figure if we break even and come up with some neat designs for our son and his friends to wear, we have succeeded. Sounds like a good plan and goes right along with the general idea of your earlier art posts. I like the look and hope they catch on. I think they should be a hit with like minded hunter/art families and those who just enjoy something other than sailboats, etc. as you mentioned. Plus, Mr.Pearson gets his first job, onesie model. Could be the start of something big for the whole family.